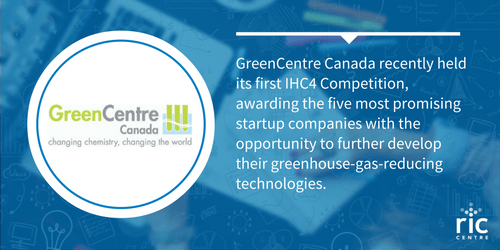 GreenCentre Canada created the InnovationHouse Chemistry Countering Climate Change (IHC4) Competition to help small-to-medium enterprises advance their technologies which have the potential to reduce greenhouse gas emissions. The competition culminated in an exciting day of back-to-back presentations from the nine finalists to a panel of experts, who then assessed and ranked each technology, potential project, and business case. 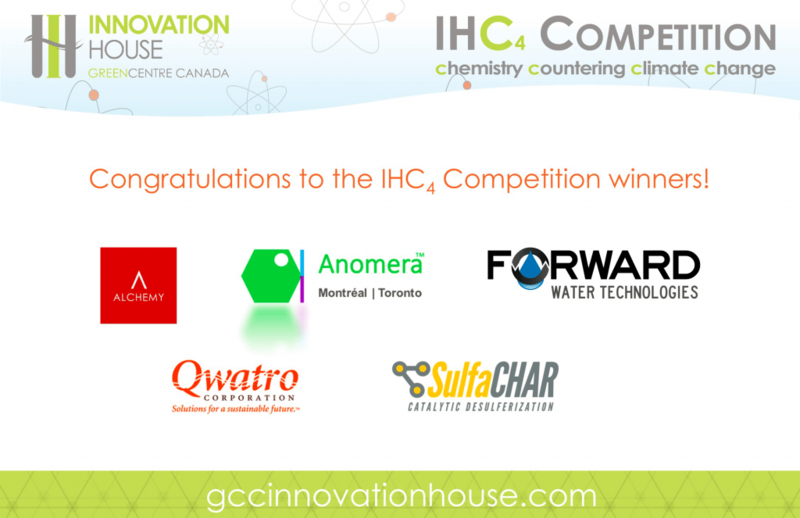 The winning companies from the IHC4 Competition are, in alphabetical order: Alchemy, Anomera (RIC Client), CHAR Technologies (RIC Client), Forward Water Technologies, and Qwatro. Honourable mention goes to the other finalists, in alphabetical order: Composite Transit Technologies Canada, Halion Displays, KaNaCell, and Springpower International. All nine finalists were competing for the opportunity to access GreenCentre’s services and expertise to complete a development project, at no cost to the client. The excitement from the IHC4 Competition day can be seen through a video which is publicly available on GreenCentre’s YouTube channel. This initiative provides GreenCentre with yet another avenue to continue supporting innovators and entrepreneurs looking to develop, de-risk, and scale up chemistry and materials-based innovations that will reduce greenhouse gas emissions and counter climate change. GreenCentre has also launched the IHC4 Call for Academic Inventions, a separate competition to grant funds of up to $50,000 to academic researchers to help develop early-stage technologies that show potential to reduce greenhouse gas emissions. More information on the IHC4 Call for Academic Inventions is available through GreenCentre’s InnovationHouse portal, along with the application form and eligibility requirements.